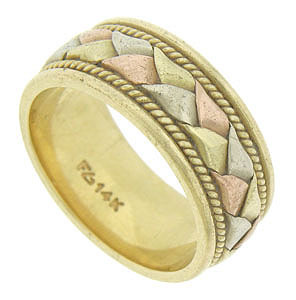 Thick ribbons of white, yellow and rose gold are braided together at the center of this handsome estate wedding band. 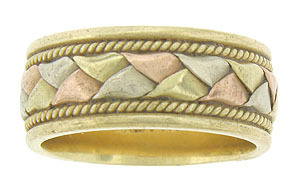 The tri-colored braid is flanked by twisting ropes of yellow gold and finished with a simple polished band. The wedding ring is crafted of 14K gold and measures 7.75 mm in width. Size 5 1/2. We cannot re-size.